Driving conditions are always more hazardous in inclement weather as rain and snow lower both visibility and traction substantially. Having a clear windshield is key for being able to drive safely, and windshield wipers are essential for keeping your vision clear. 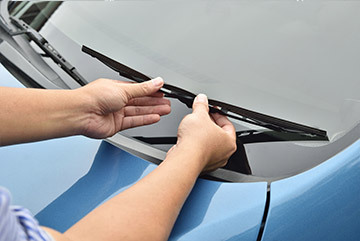 Any time your wipers do a poor job of neatly clearing your windshield, you know that they are overdue for a replacement. The upside is that replacing your windshield wipers only takes a few minutes and is an affordable fix to a potentially dangerous situation. Never use your windshield wipers on an icy windshield. This can damage your wiper blades by scratching the blades on the ice. Scratches on the blades will cause a streaky, uneven swipe across your windshield while in use, which can be distracting while driving. We recommend replacing your wiper blades at least once a year, and any time they begin to show signs of wear, so you will be well prepared for any nasty weather.